Thanks to Dr. Shaesta Naseem Zaidi, King Khalid University Hospital (Saudi Arabia) for contributing this case. To contribute a Case of the Week, follow the guidelines on our main Case of the Week page. (1) Remember to add NatPernick@gmail.com to your SafeList / Address book, so our email subscriptions go directly into your inbox. 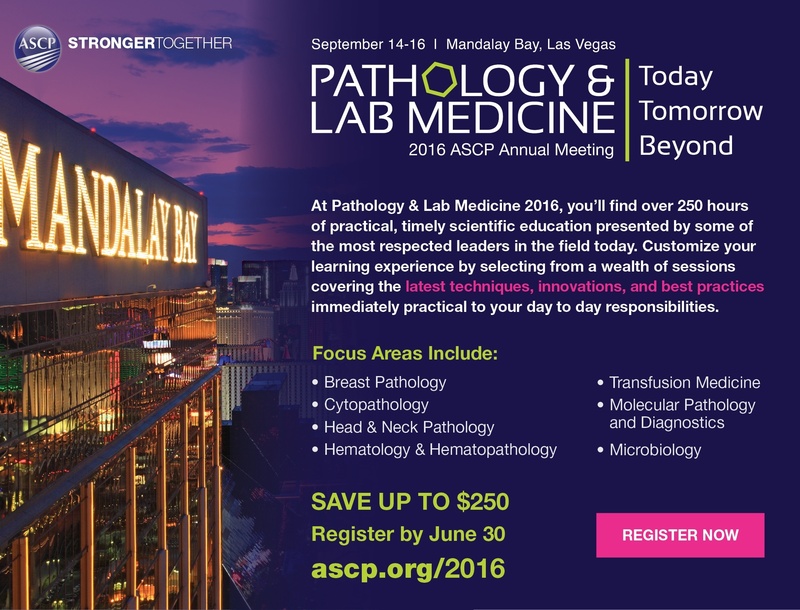 Also bookmark and use our Amazon.com link to remember to shop at Amazon.com, and at the same time, support PathologyOutlines.com. (2) We have made some changes to our website to reduce wait times and down times. We have added a content delivery network, which basically makes copies of our website and distributes it to dozens of servers throughout the world. Click here to read more. (3) We posted new Product Questionnaires from Olympus America Inc., OPTRONICS, Photometrics, QImaging, Swift Optical Instruments, Inc. and ViewsIQ in the Imaging / Digital / Photography section to help you compare and contrast. BoardVitals posted a New Product Announcement. A 53 year old woman presented with pain in the left hypochondrium (upper abdomen) x 4 months. A vague mass was palpated there, not moving with respiration. Labs were within normal limits. A gastro-fibroscopy revealed a well circumscribed elevated lesion in the gastric fundus. 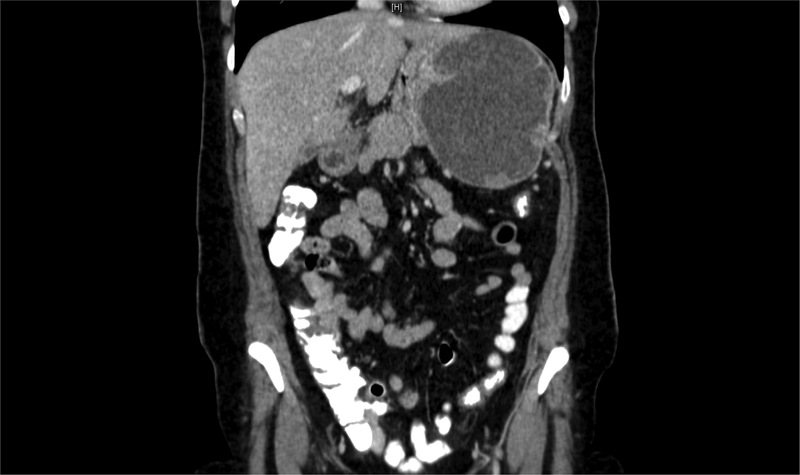 An abdominal CT demonstrated a large, well defined cystic lesion, 9.7 x 8.8 x 1.1 cm, in close relation to the left lateral wall of the stomach, with a thick enhancing wall and internal septations. 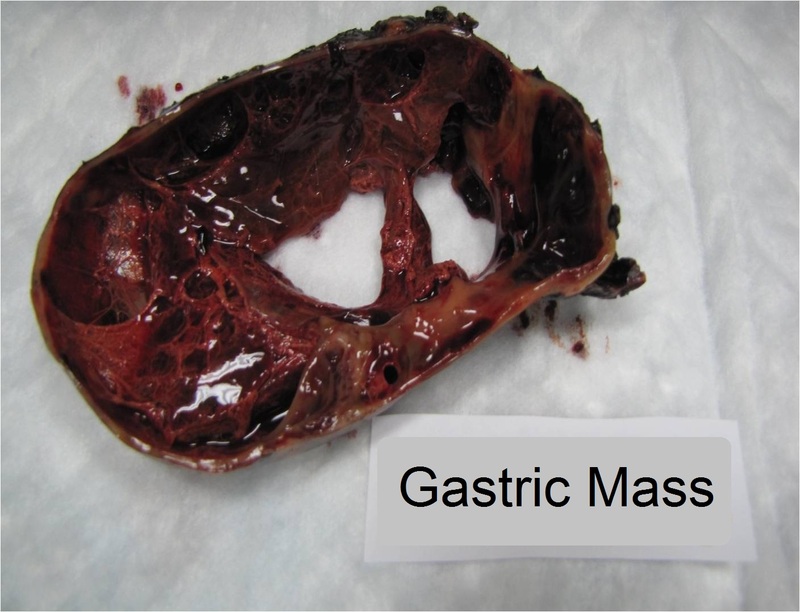 The patient underwent laparotomy and resection of the gastric mass. Grossly, the tumor measured 10 cm in maximum dimension. The cut section was multi cystic and filled with hemorrhagic fluid. 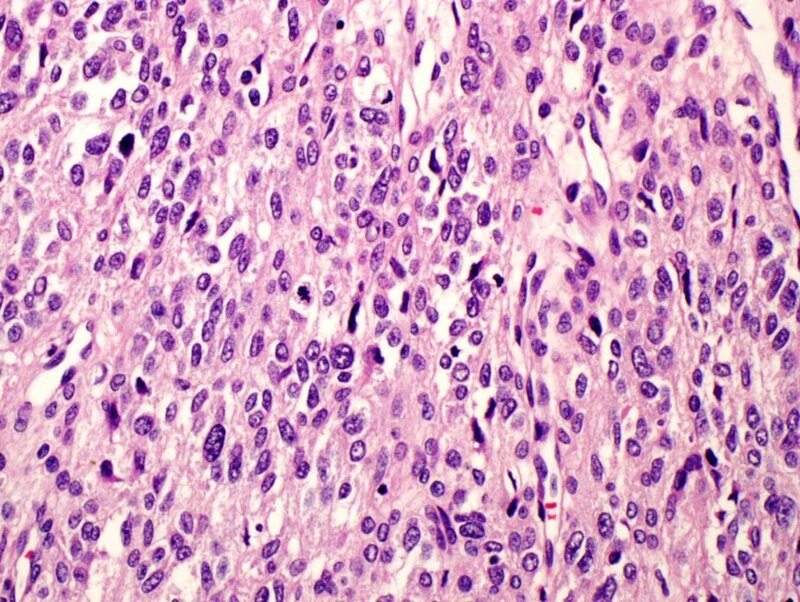 Glomus tumors (GTs) are rare tumors that typically present as blue-red soft tissue nodules on the extremities. The most common site is under the fingernails. Paroxysmal pain, especially on exposure to cold temperatures, is a classic symptom. However, GTs can be painless and have been reported throughout the body, including visceral locations such as the GI tract and lung. 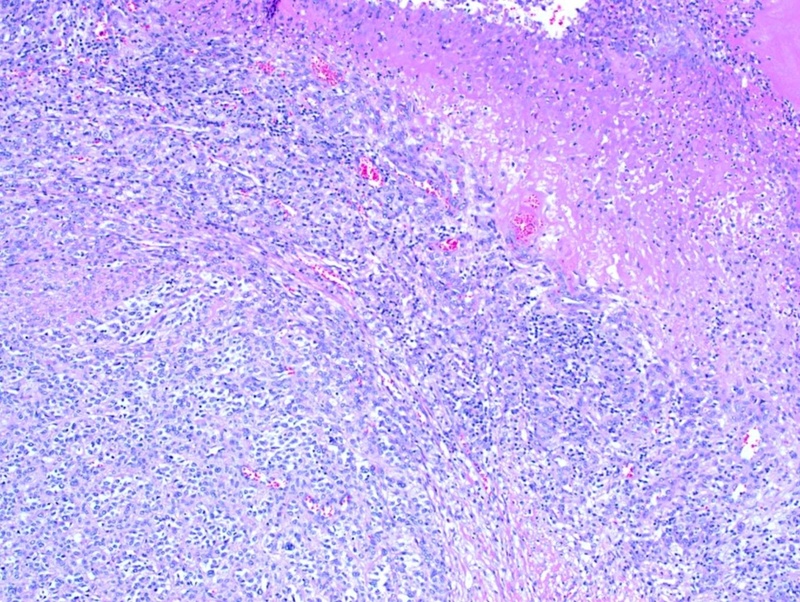 Nearly all GTs (~ 99%) are benign, although there is a 10% risk of local recurrence after excision (Goldblum: Enzinger and Weiss's Soft Tissue Tumors, 6th ed, 2013, Arch Pathol Lab Med 2008;132:1448). Non-neoplastic glomus cells are found in glomus bodies, which are specialized arterio-venous anastomoses in the dermis that regulate heat. 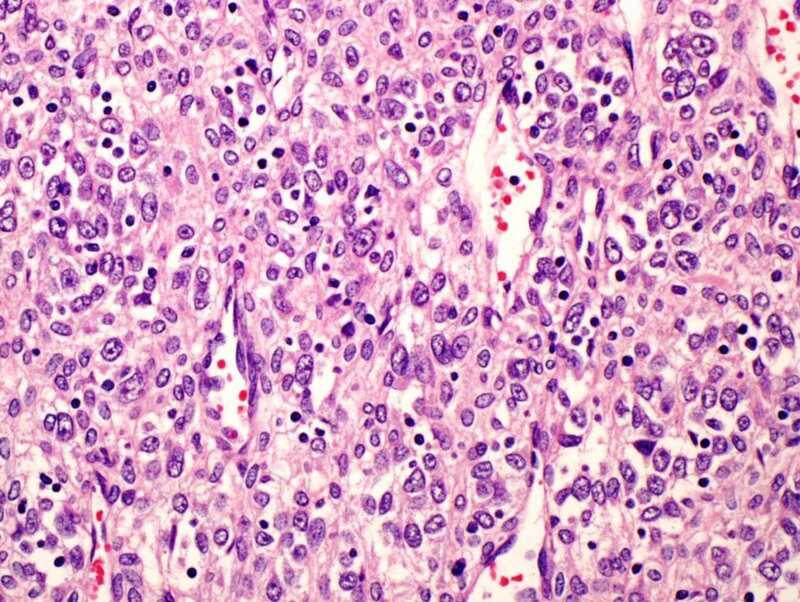 Glomus cells are uniform, round cells with regular, round nuclei. 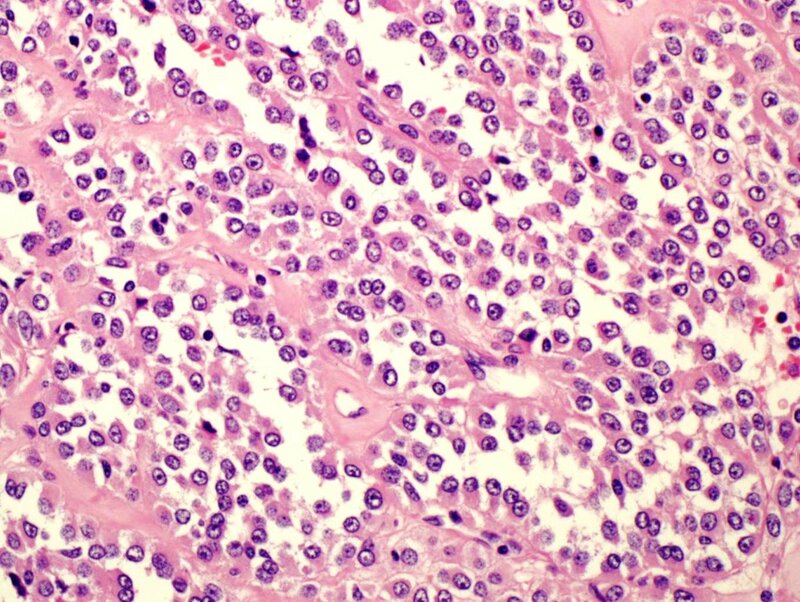 The cytoplasm is usually amphophilic or eosinophilic, but may be clear or oncocytic. • glomangiomatosis (diffuse GT), which consists of well formed vessels accompanied by glomus cells that grow in an infiltrative pattern (Goldblum: Enzinger and Weiss's Soft Tissue Tumors, 6th ed, 2013, Arch Pathol Lab Med 2008;132:1448). The stomach is the most common site for visceral GTs, especially the antrum. Presenting symptoms include a palpable mass, upper GI bleeding, anemia and ulcer-like pain, although many are found incidentally. The tumors are centered in the submucosa or muscularis propria, but may involve and ulcerate the overlying mucosa (Am J Surg Pathol 2002;26:301, Int J Clin Exp Pathol 2014;7:1438, Gut Liver 2012;6:52, Oman Med J 2016;31:60). 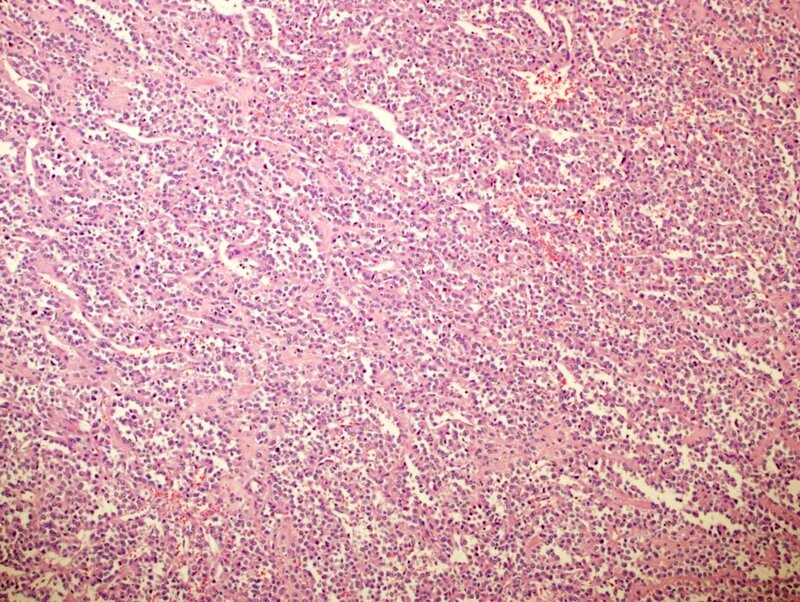 As in soft tissue, the solid type is the most common pattern, with a few cases of glomuvenous malformation reported (Int J Clin Exp Pathol 2014;7:1438). Vascular invasion can be present but is not felt to be prognostically significant (Am J Surg Pathol 2002;26:301, Am J Surg Pathol 2001;25:1). 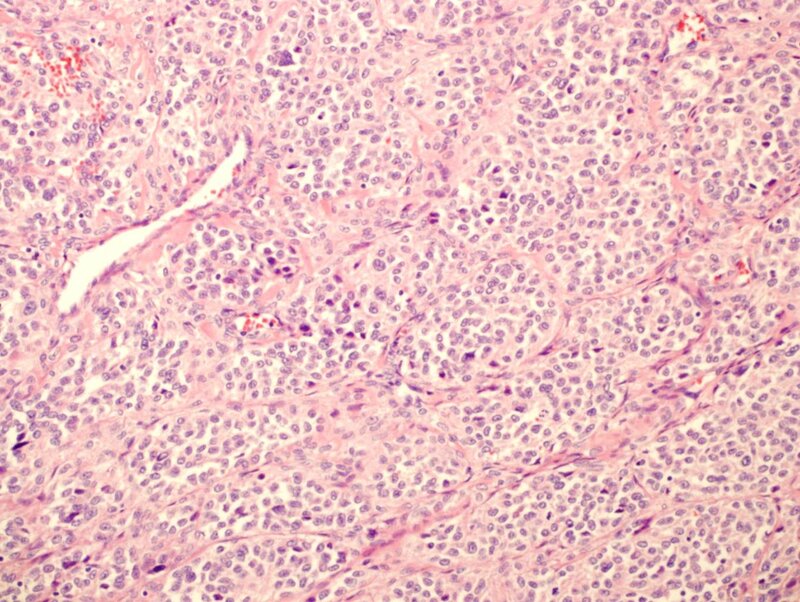 Because rare GTs have atypical features, and even rarer tumors have metastasized, Folpe et al proposed criteria in 2001 to help identify tumors with malignant potential (Am J Surg Pathol 2001;25:1). The criteria have been modified slightly since that study. 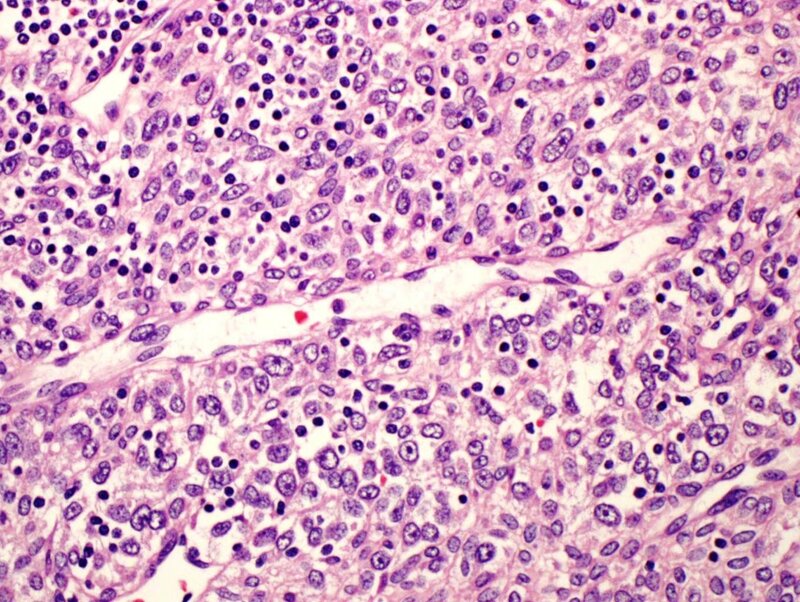 Currently, for GTs to be considered malignant they must have marked nuclear atypia and a mitotic rate of > 5 per 50 HPF, OR they must have atypical mitotic figures. 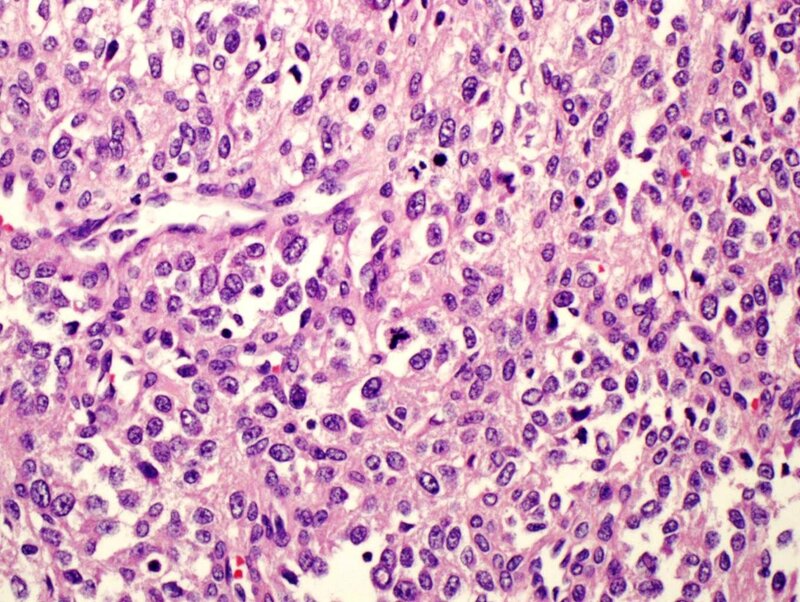 Tumors of uncertain malignant potential are ones that are located superficially (relative to muscular fascia) and have a mitotic rate of > 5 per 50 HPF but no significant nuclear atypia, OR a deep location OR are larger than 2 cm. If nuclear atypia is the only atypical feature, this is considered a benign "symplastic" GT (Goldblum: Enzinger and Weiss's Soft Tissue Tumors, 6th ed, 2013, Am J Surg Pathol 2001;25:1). 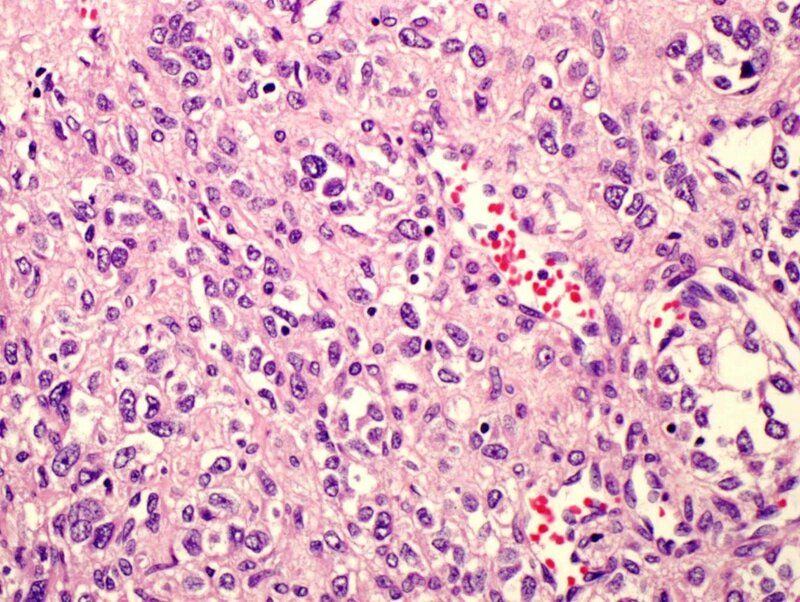 Interestingly, two of the reported gastric GTs that metastasized did not meet the updated criteria for malignancy - they showed only mild nuclear atypia, a low mitotic rate and no atypical mitoses; however they were large and deeply situated, and would now be considered to have uncertain malignant potential at initial diagnosis (Am J Surg Pathol 2002;26:301, Am J Surg Pathol 2001;25:1). Special criteria for malignancy may be needed for gastric GTs, such as size > 5 cm or the presence of spindle cell change (Am J Surg Pathol 2002;26:301). 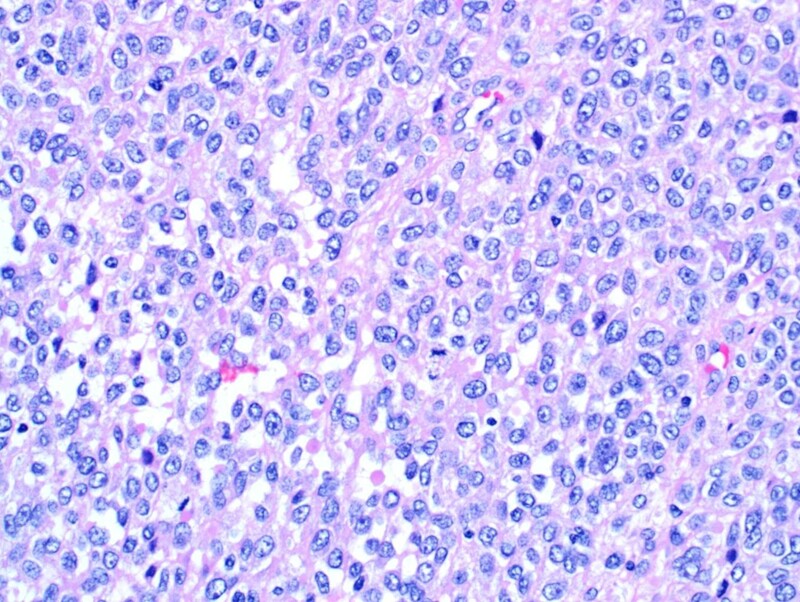 The current case is malignant histologically due to nuclear atypia and atypical mitoses. 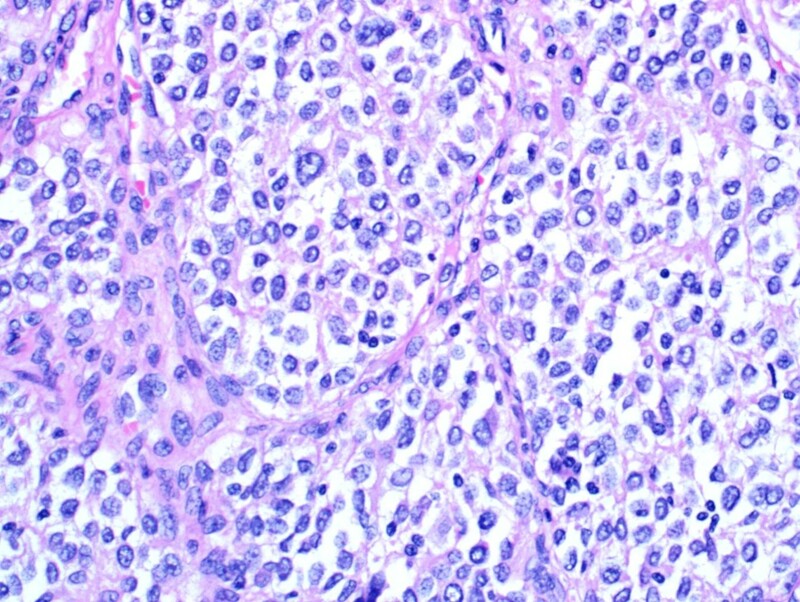 Malignant GTs generally have either (a) small round blue cells, or (b) spindled cells arranged in short fascicles similar to fibrosarcoma. Approximately half of malignant cases contain an area of benign GT, which makes the diagnosis more straightforward (Goldblum: Enzinger and Weiss's Soft Tissue Tumors, 6th ed, 2013). Without this, IHC may be needed. GTs are positive for vimentin and smooth muscle actin, and have a pericellular "net-like" positivity for type IV collagen and laminin. Desmin and CD34 may be positive, but S100, CD45, CD20 and keratins are negative. Interestingly, GTs in the stomach (but not in the soft tissue) can show staining for synaptophysin, but they are negative for CD56 and chromogranin (Am J Surg Pathol 2002;26:301, Int J Clin Exp Pathol 2014;7:1438, Gut Liver 2012;6:52, Oman Med J 2016;31:60). 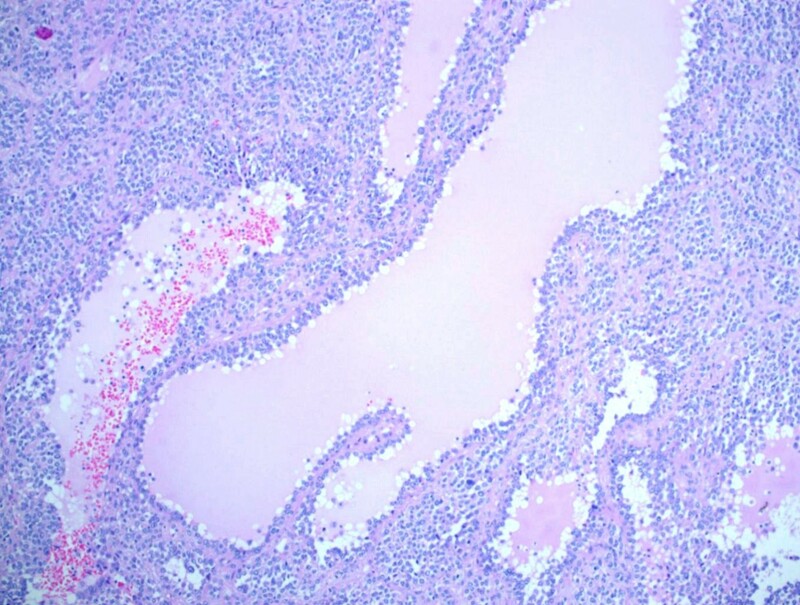 See Oman Med J 2016;31:60 for images of the immunostains in this case. 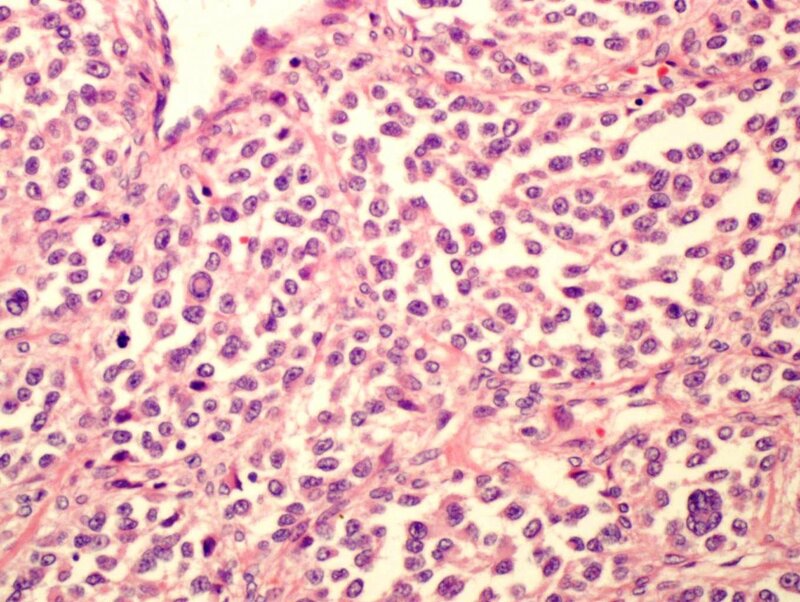 In the stomach, the primary differential diagnosis is epithelioid GIST, which has some overlapping IHC. 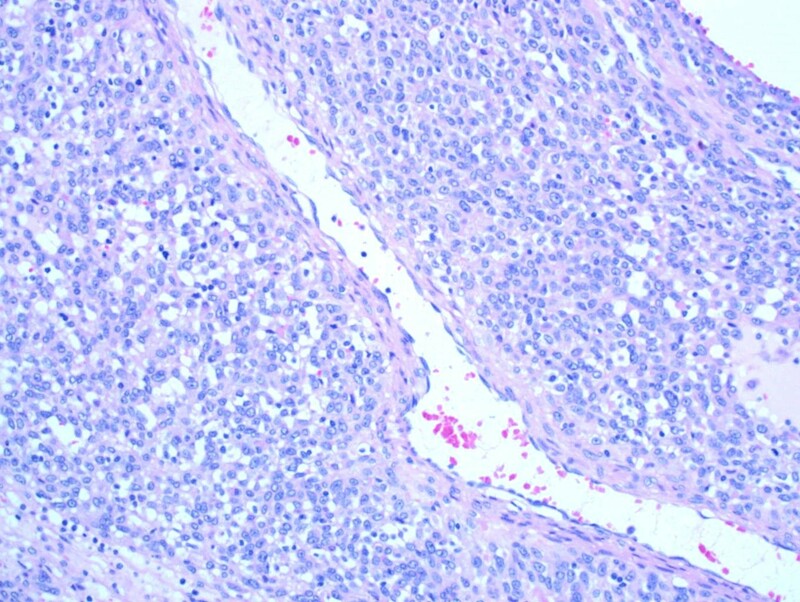 GTs are negative for CD117 (except for mast cells that may be present), but epithelioid GISTs can also be negative. 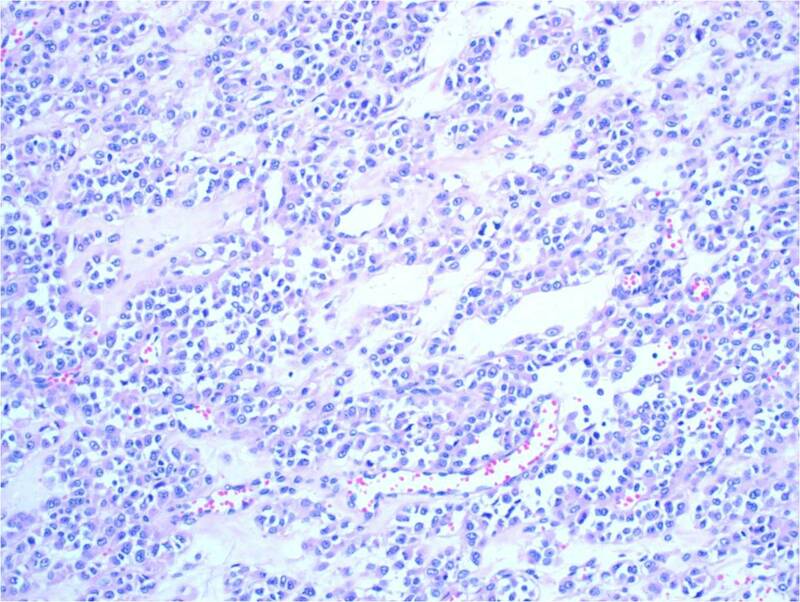 GTs can show focal, weak staining for DOG1 (Histopathology 2010;57:250), and epithelioid GIST can show focal SMA positivity and focal pericellular positivity with collagen IV and laminin (Am J Surg Pathol 2002;26:301). Difficult cases can be resolved with molecular testing - GTs do not have KIT or PDGFRA mutations (Am J Surg Pathol 2002;26:301, Histopathology 2010;57:250). GTs have been associated with a few different mutations. The most common seems to be MIR143-NOTCH fusions, reported in 21/33 cases by Mosquera et al (Genes Chromosomes Cancer 2013;52:1075); their cohort included one benign gastric GT and one malignant GT with omental implants, and both were positive for NOTCH2 rearrangements by FISH. 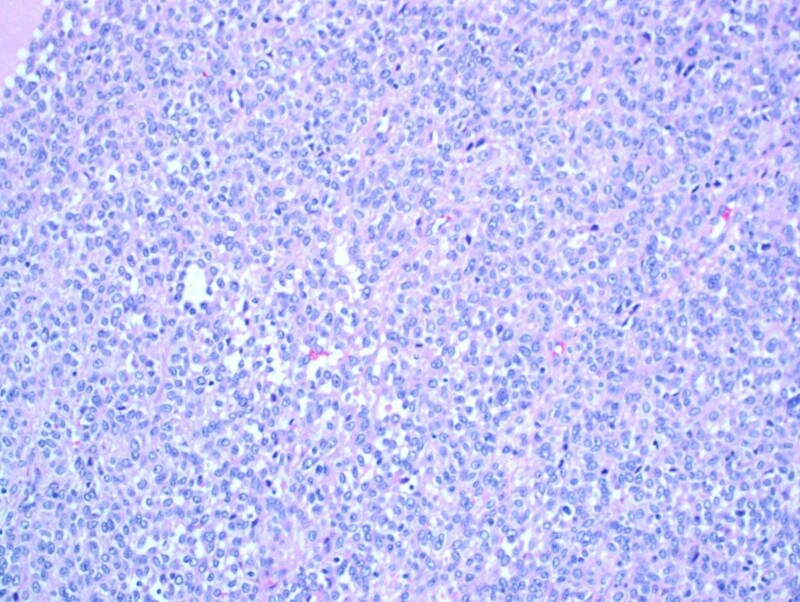 Additionally, there is a familial variant of GT where patients have multiple glomuvenous malformations due to inactivating mutations in the GLMN (glomulin) gene. Finally, there is an association between neurofibromatosis and digital GTs (Cancer Res 2009;69:7393).